Join us live each week at www.productivity.academy/live and get your questions answered by submitting them at any time right here: www.productivity.academy/questions. Making the best use of your time is of course one fundamental of productivity optimization. And if you’ve read other articles about meetings, you will know that there are several ways in which you can make meetings more time-effective and get better results. But what happens after a meeting? How to make sure that everyone is on the same page? In this article, I want to dive into meeting notes. Can you automate your notes? What is the best way to share them with the whole team? How to make your notes more efficient? If you’d like to spend less time on meetings, know that your notes are taken care of, and help your team – keep reading and watch the video above for details. Let’s say that you use Google Docs. Your first step will be to create a meeting notes template file. You should save it in a dedicated folder — something easily recognizable such as “weekly meeting notes” — and customize it to your needs. It could be a good idea, for example, to add a fixed short paragraph at the top that will appear in all your notes: a reminder of your company’s core values, or the main goal of these weekly meetings. Remember to always start your meeting on a positive note. Compliment your team for a target that has been reached, a positive outcome of last week, an impressive KPI. This will help get everyone off to a good start and highlight some of the great things that have been done over the past week. As you close the meeting, a summary of your action items is very important. Always make sure that everyone leaves the room or conference call knowing exactly what they need to do and when, and not wondering what the whole point was. 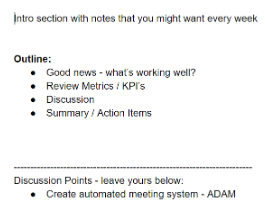 This can be done as a quick verbal summary or a short review of the shared notes doc. Automating meeting notes means to create a new file every week at the same time. You can easily create a Zapier trigger to do so. 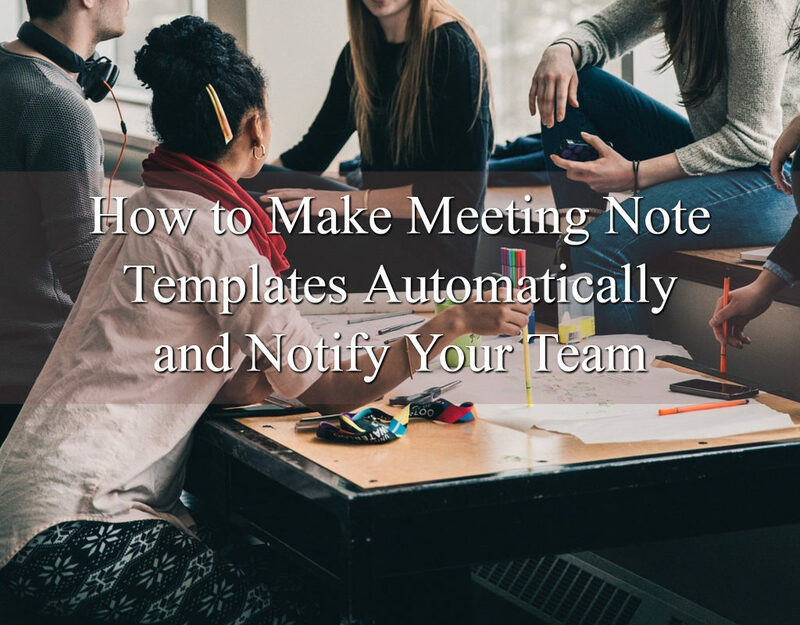 As you want your whole team to be able to upload their notes too, I would advise you to set it up for a few hours after your meeting time. You can instruct Zapier to create the file for you by duplicating the meeting notes template that you have written before. Just make sure to set it up so that Zapier will name the new duplicate with the date of creation instead of simply “Copy of” (you can that from Convert to Document>File Name). This way, your team will easily identify the new document to paste their notes. Again – see the video above for the details steps! So now you will have a clean Google Doc for every meeting. But what to do with it next? You can add a notification such a Zap or Slack message that is sent out to the meeting attendees every time a new document is created in the folder — maybe including a direct link. I’ve found that this prevents the “but I don’t know where it is” or “I forgot so I didn’t add notes” syndrome from happening…just pipe it into your teams best communication channel via automation. I have calculated that the one-time setup takes about 30-45 minutes and will save you 10-15 minutes per week (in case of a weekly meeting). This means that the process will pay itself off within the first month and over the next few months, it will have saved hours of your time. It is not only about hours and minutes, though. Getting into the process and having a set framework in place for your meetings will make them more effective. Everyone will know where to get the information they need and will be reminded to add to the conversation. 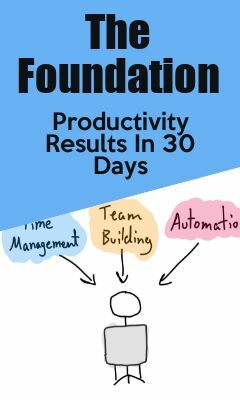 Over time this really adds up – you save time and the team gets more effective – win! This article was posted in Automation. « What Are Some “During The Flight” Airplane Hacks? Start Doing What YOU Want. Productivity Makes Your Life Happen. © 2019 The Productivity Academy. All Rights Reserved.